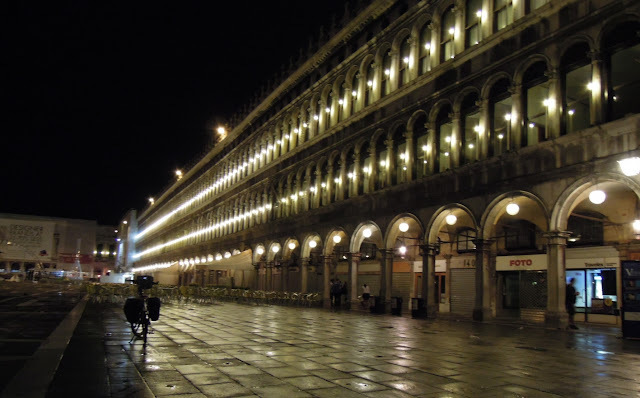 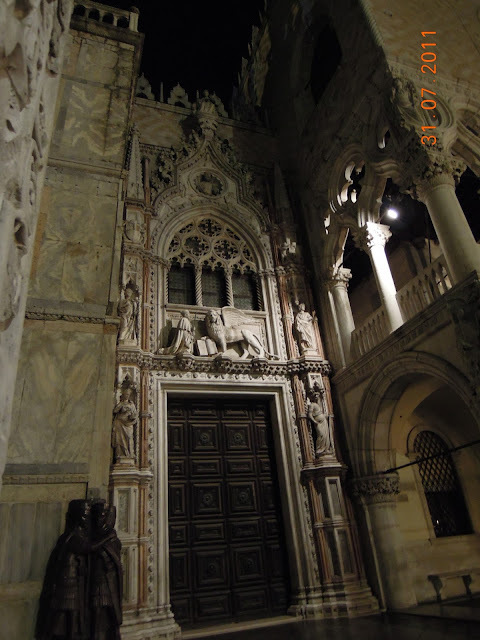 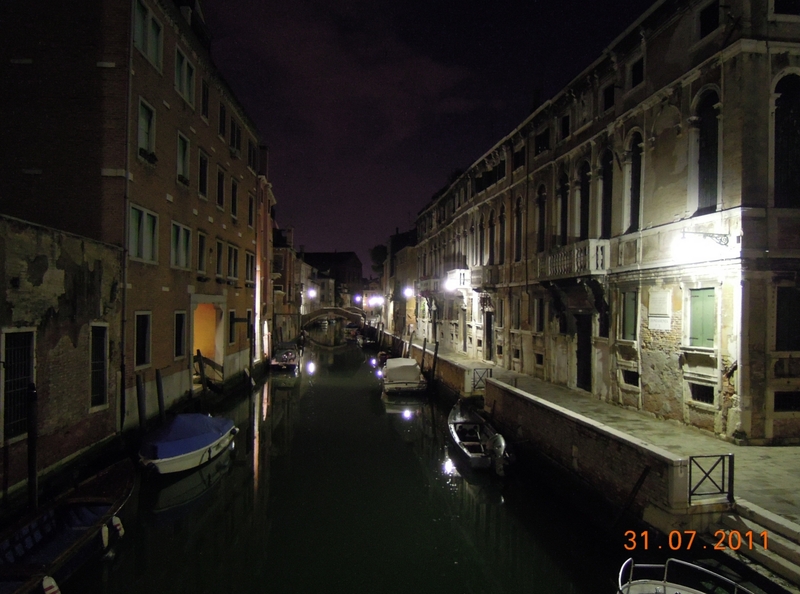 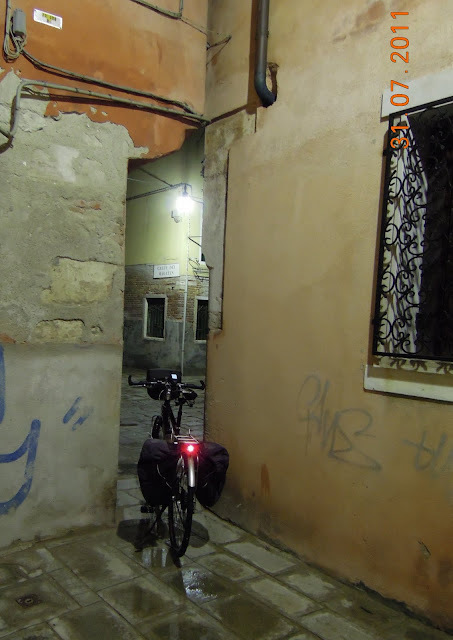 Well, I’ve being thinking about a possible nightly trip across Venice since last May, let’s say just after my first cycling time in the real deep and dark night of Milano. 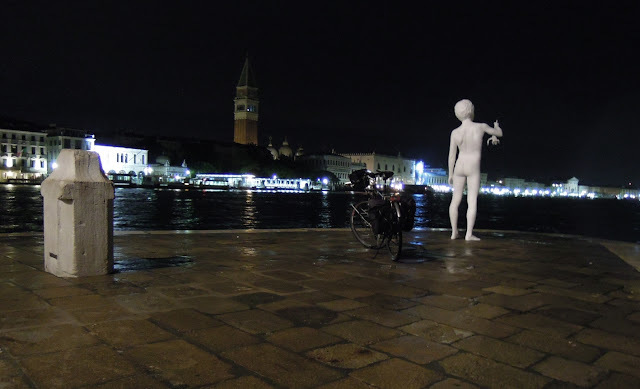 Simply ...a fantastic experience that one: I've been discovering that cycling in the night can be so much fascinating especially because no traffic at all, no noisy tourists, rare and "strange people of the night" all around and above all, what’s really magic indeed, a unique mix of silence, an unusual air and a sort of very special illumination. 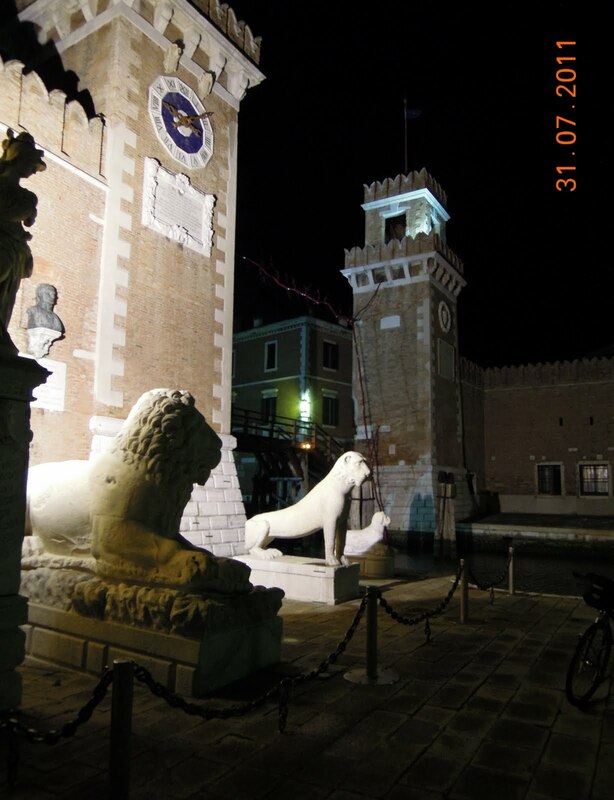 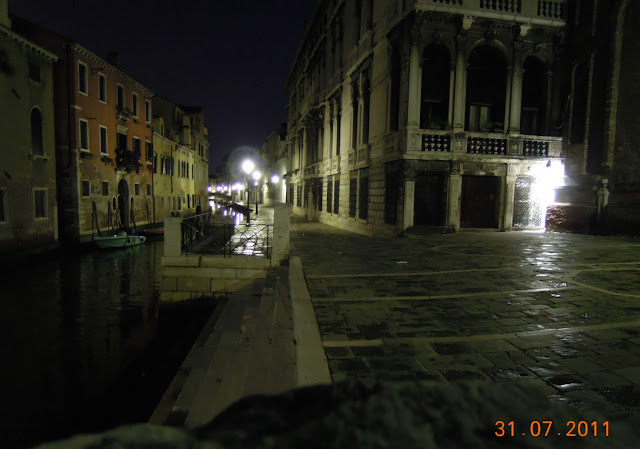 So, ... next time Venice I thought, what could be better to repeat such an experience! Before that, I’ve been in Venice many times of course but, to be very honest, since then my feeling had been just a sort of a plain “tourist” feeling … nothing more. Weather, this summer, looks to be quite crazy all over here. 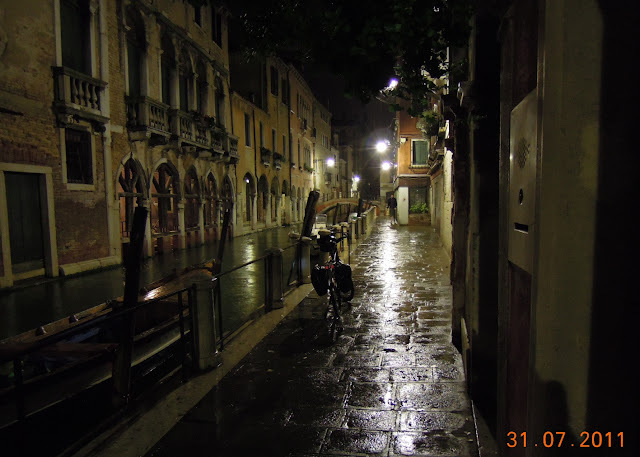 It rains and then … it rains again. 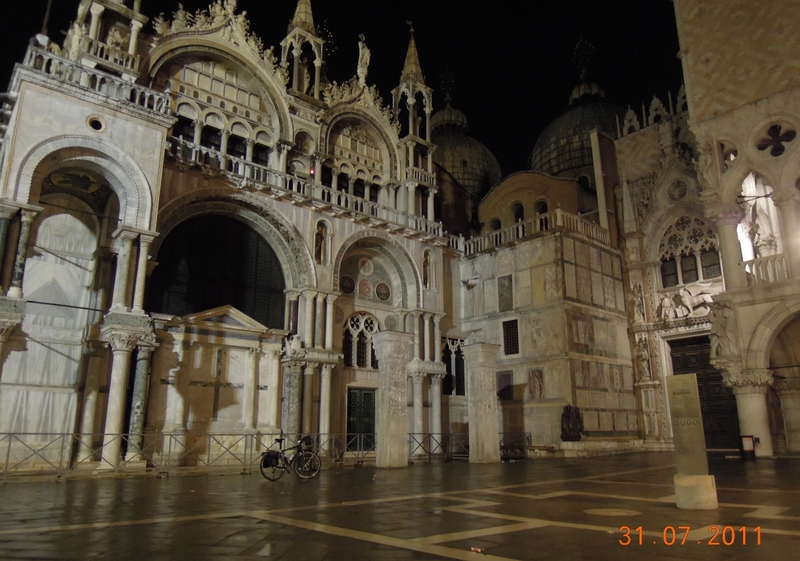 My original program was actually to go to Venice since the beginning of July but, delay after delay, I decided for Saturday the 31st. I left home with the sky that was not promising anything of good at all. 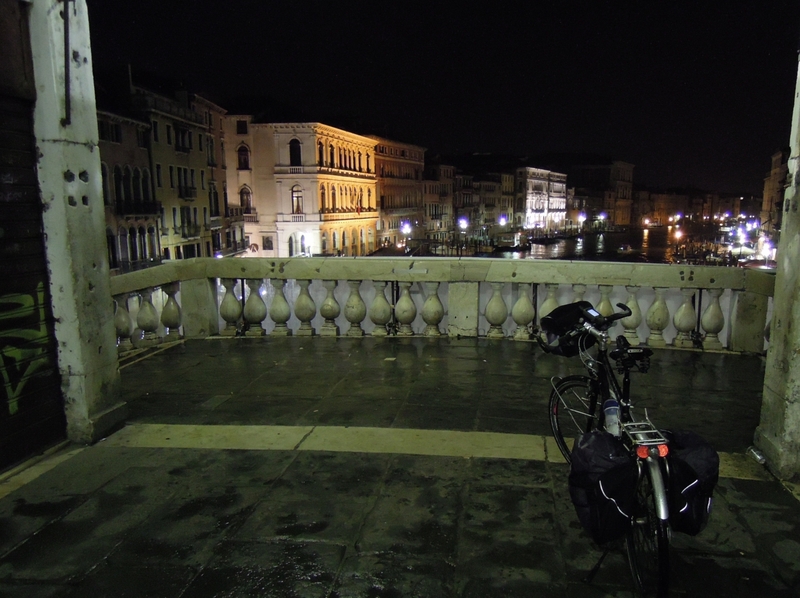 I arrived by car at Porto Marghera, in the mainland, just after midnight and immediately I realized that quite likely I had to cycle all the night under a pretty nice rain! 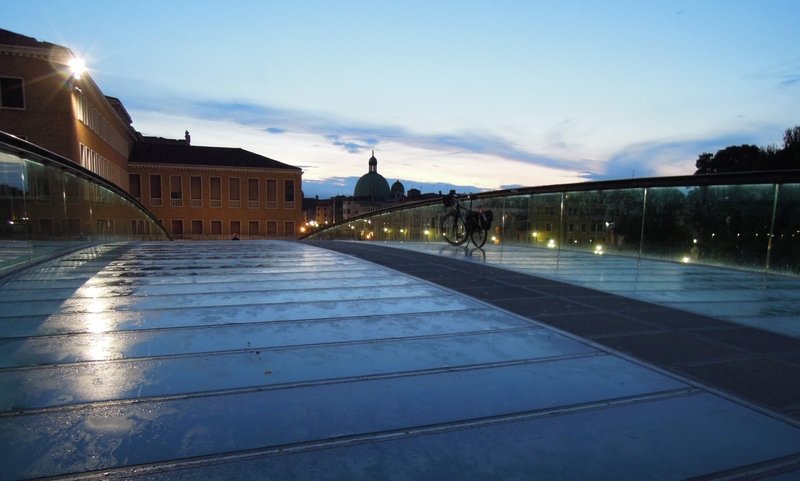 After preparing the “bici” and myself, I reached Venice through the 4 km bridge (known as Ponte della Libertà) that connects the mainland to Venice under an impressive heavy rain and very nice looking lightnings illuminating the whole “Venice laguna”. 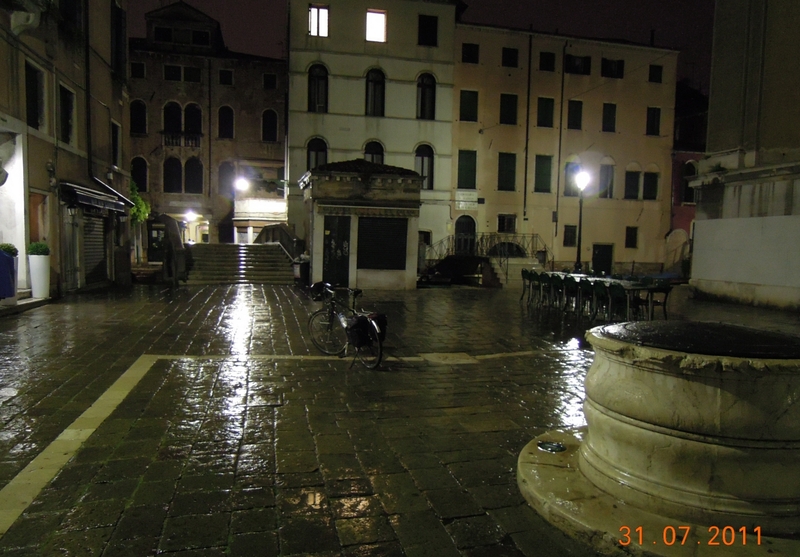 Hordes of people were already fleeing away trying to get repair under shelters of any type. Fortunately I’m very used to cycle in the rain, I’m very well equipped and so I didn’t stop, I never stop just for rain, .. 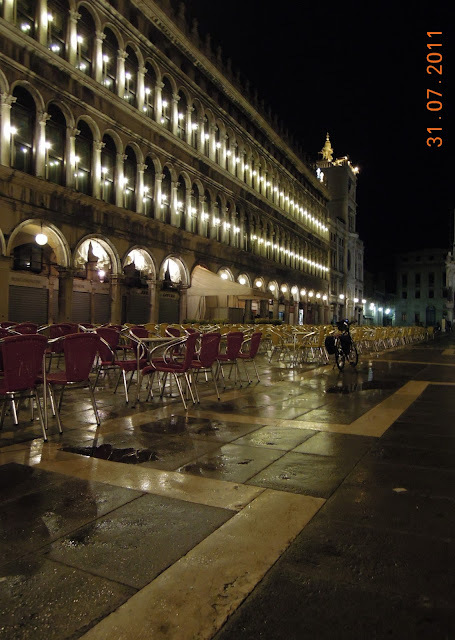 usually!! 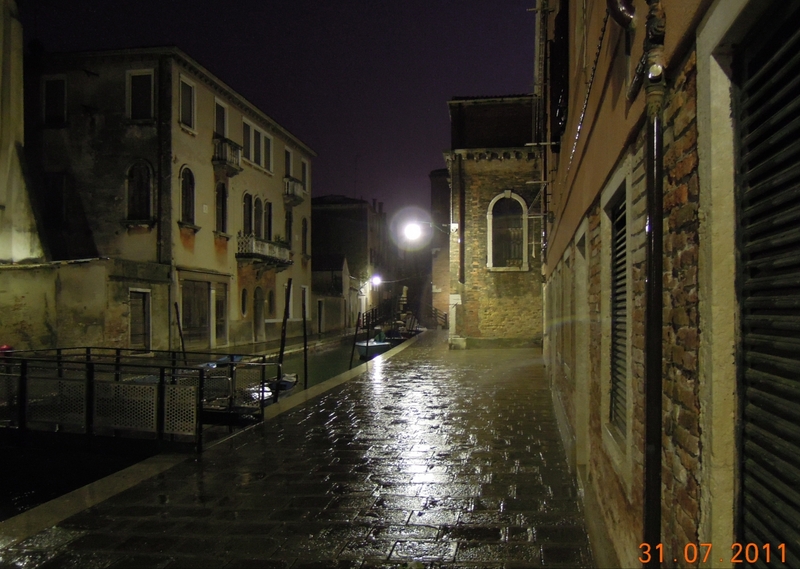 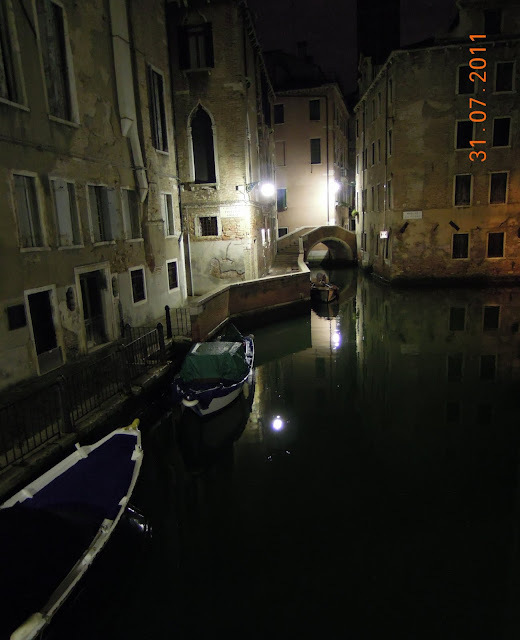 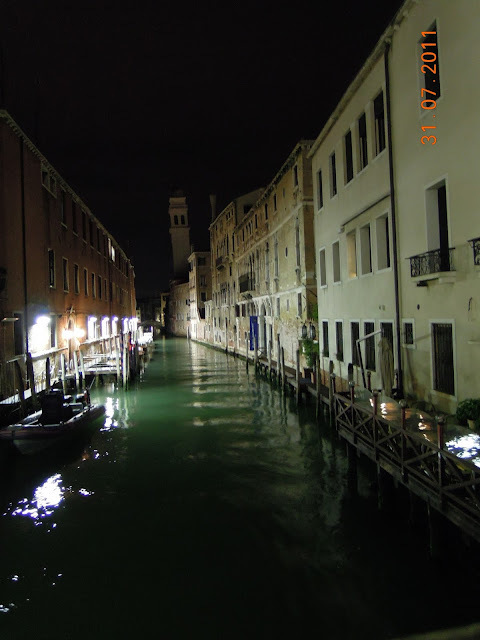 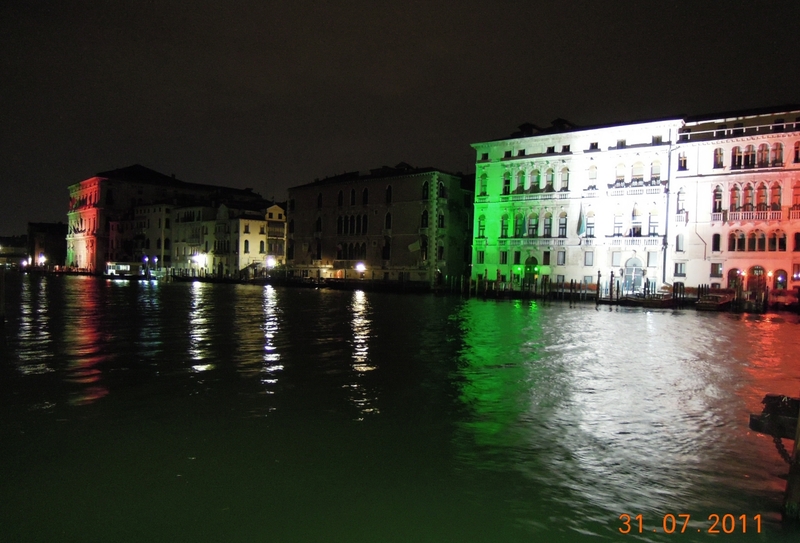 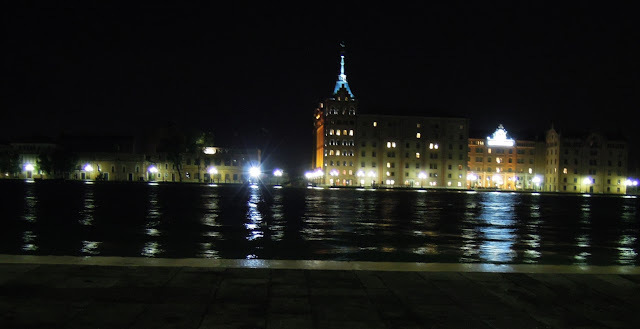 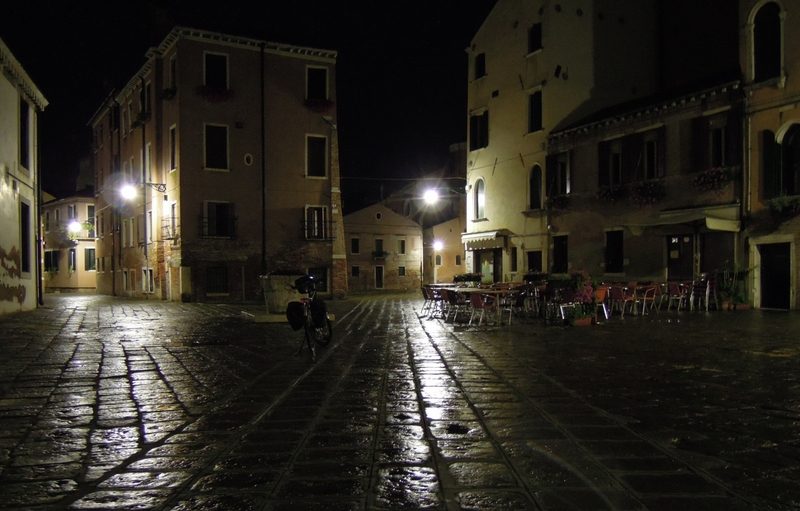 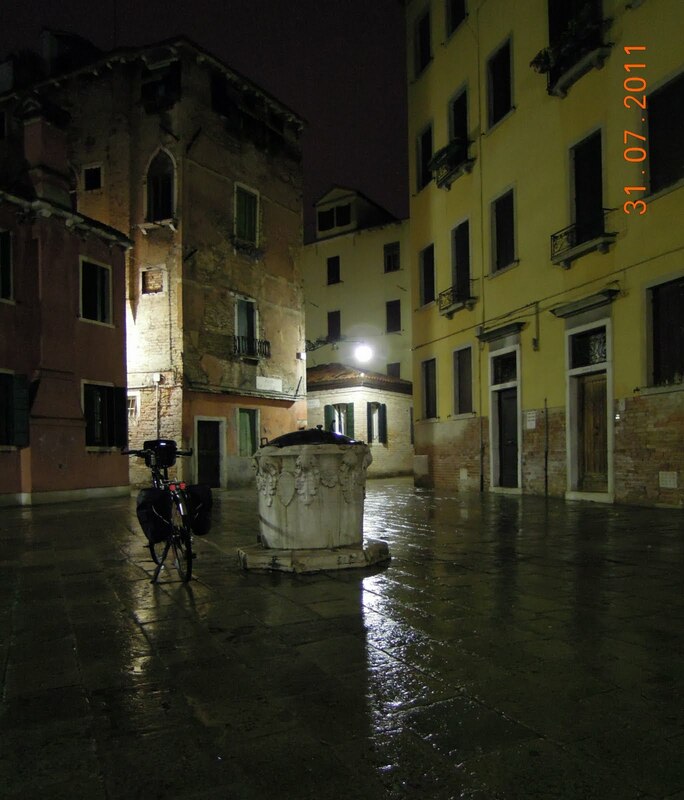 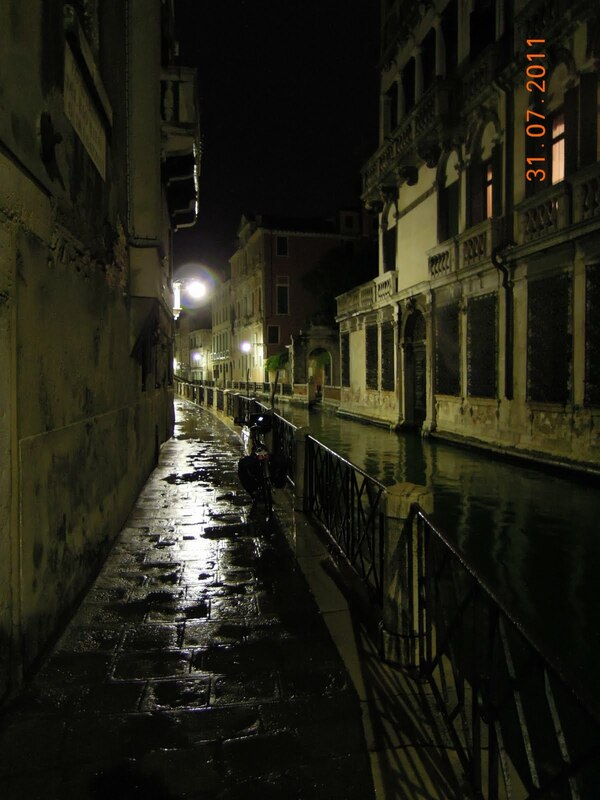 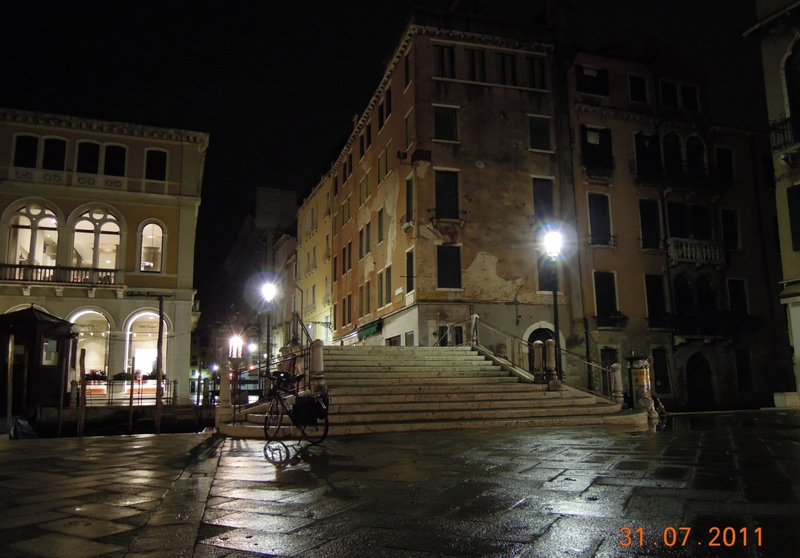 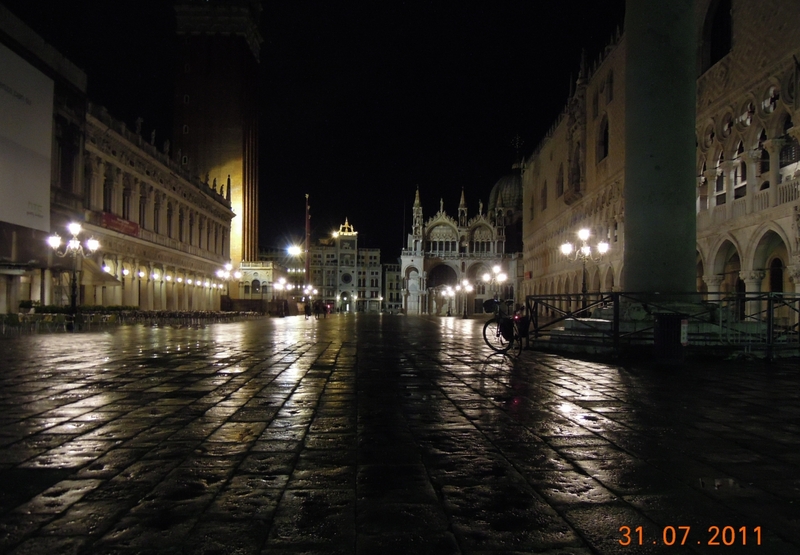 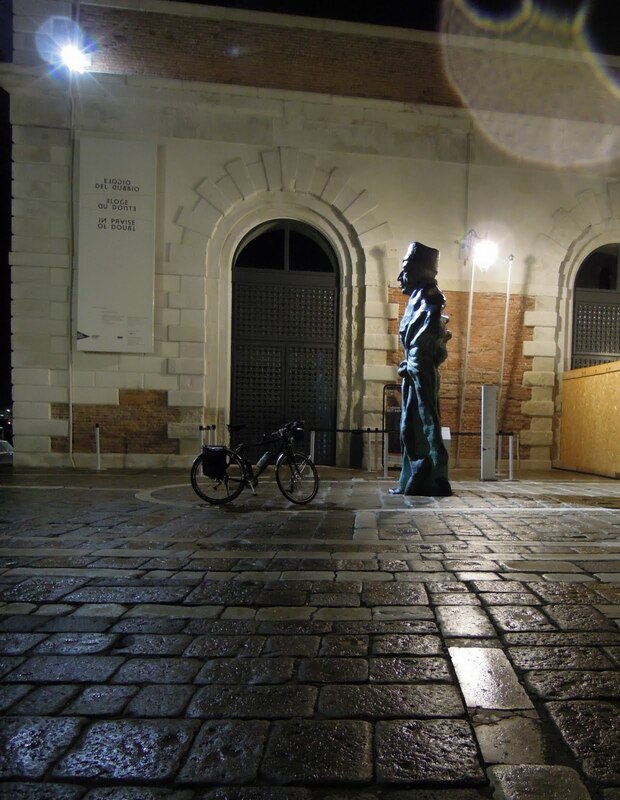 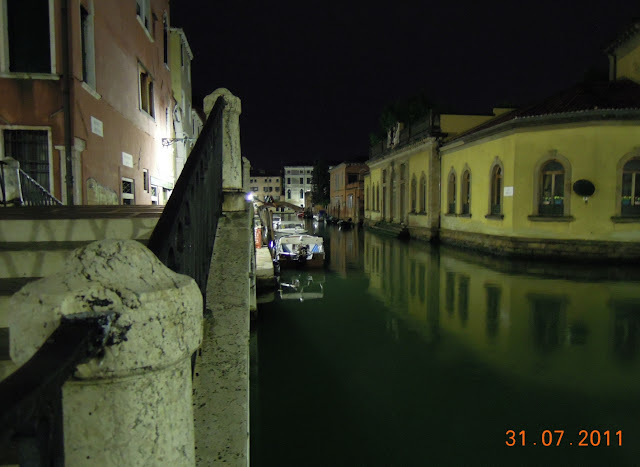 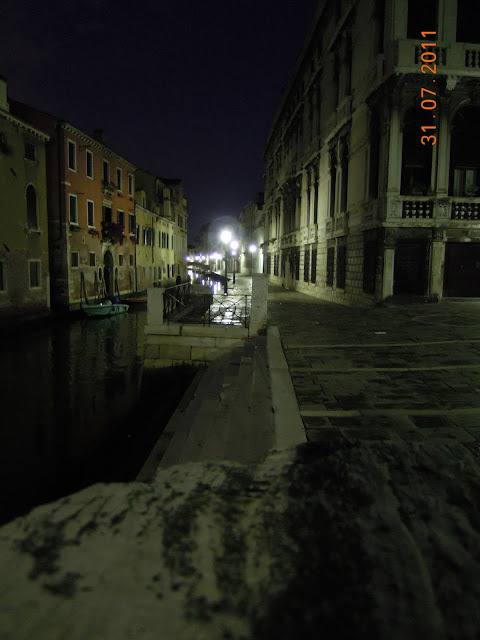 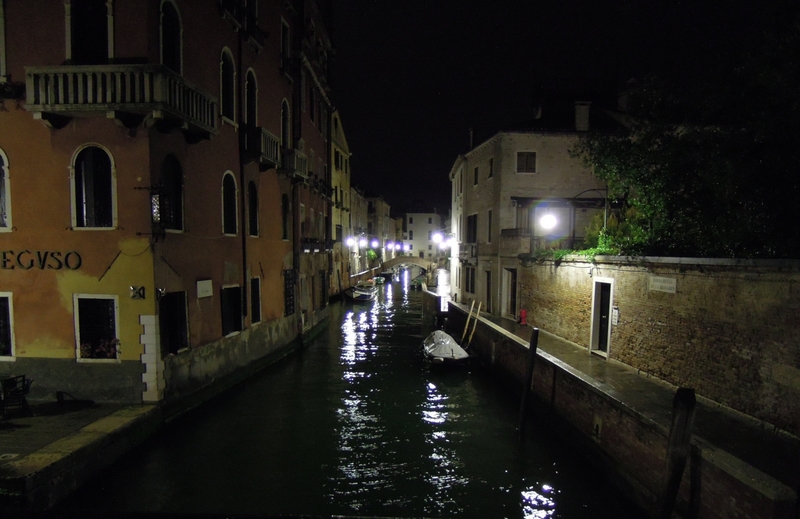 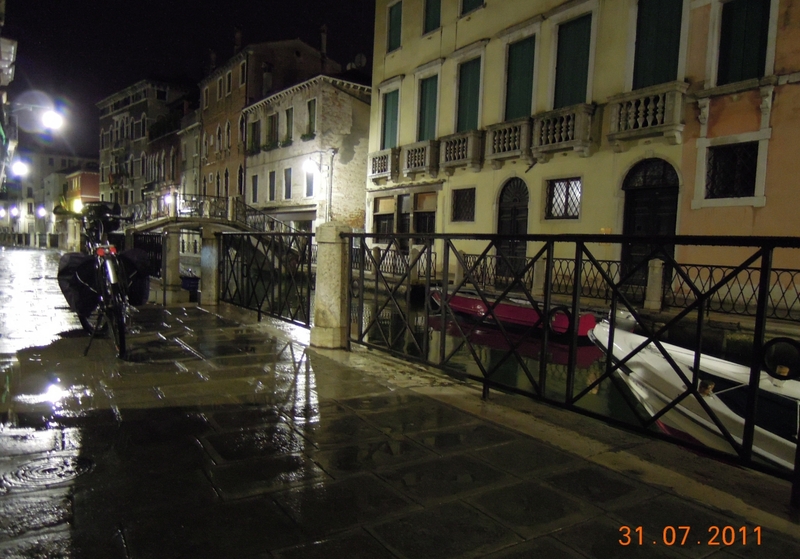 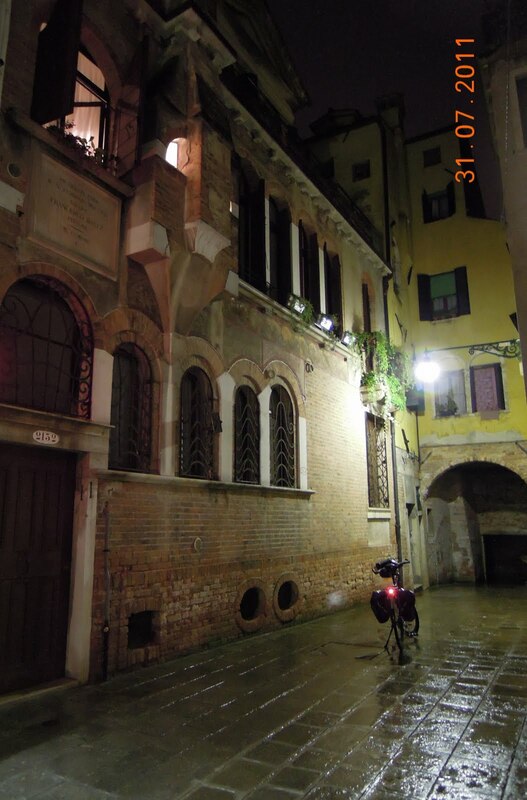 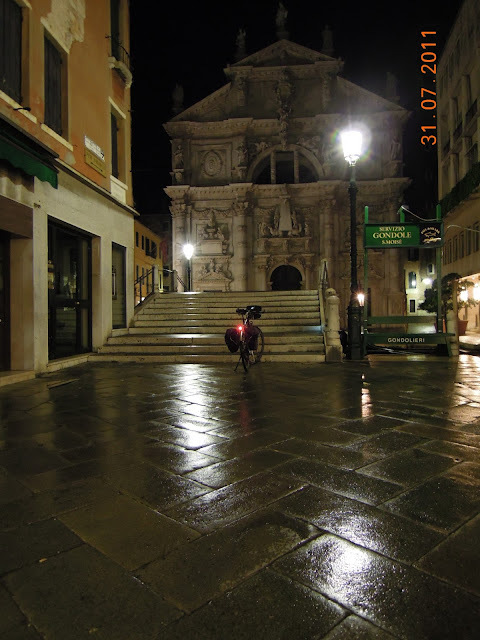 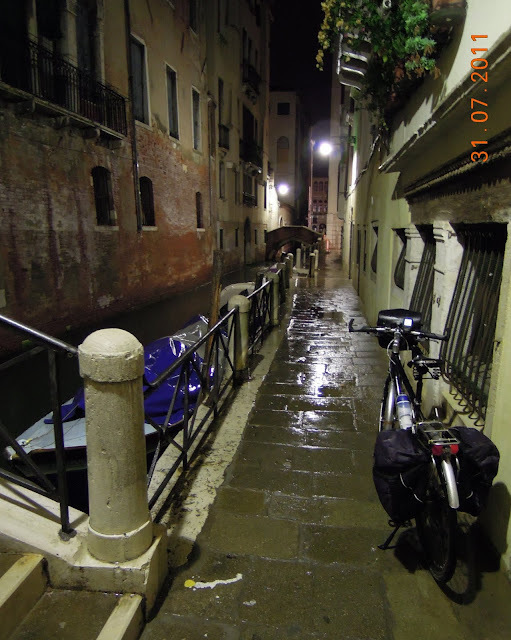 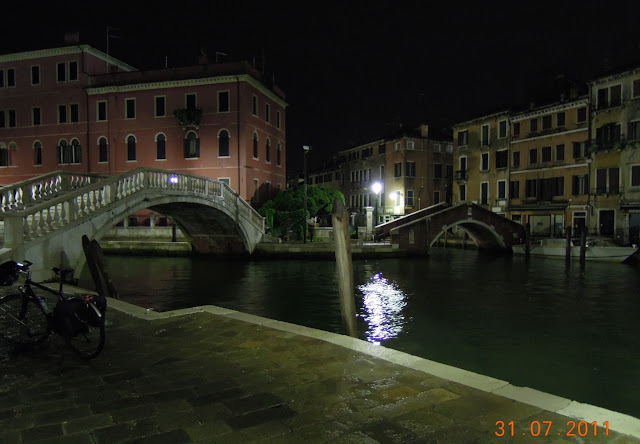 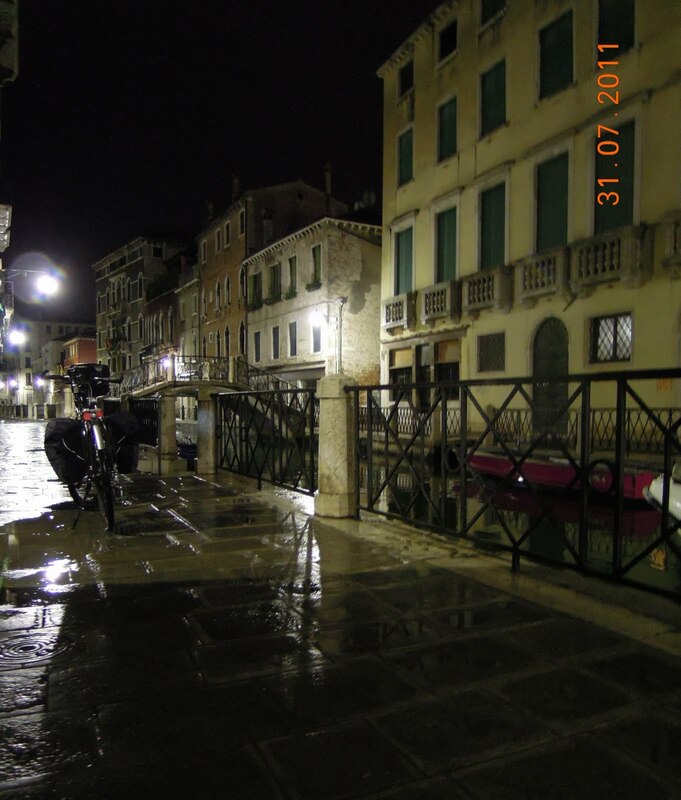 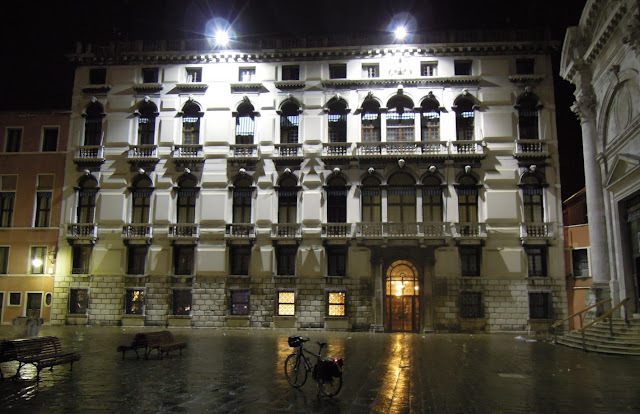 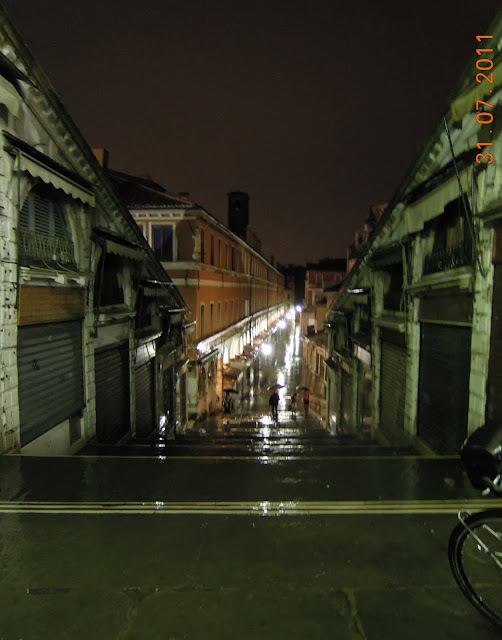 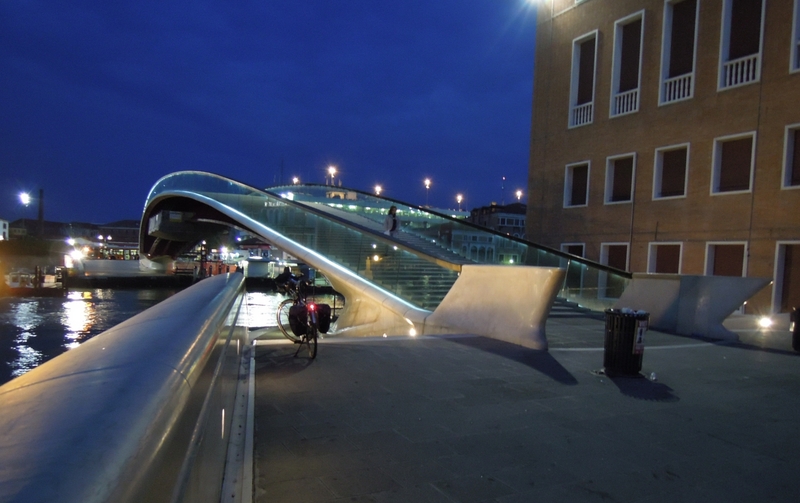 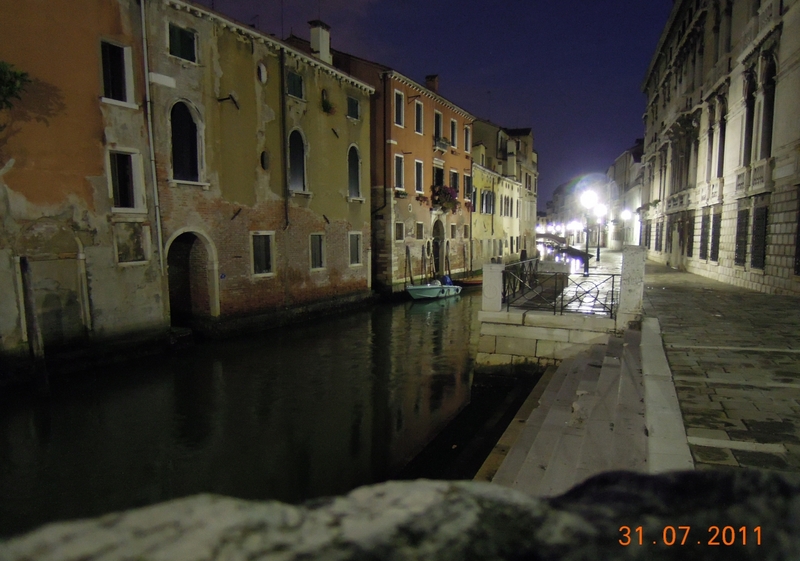 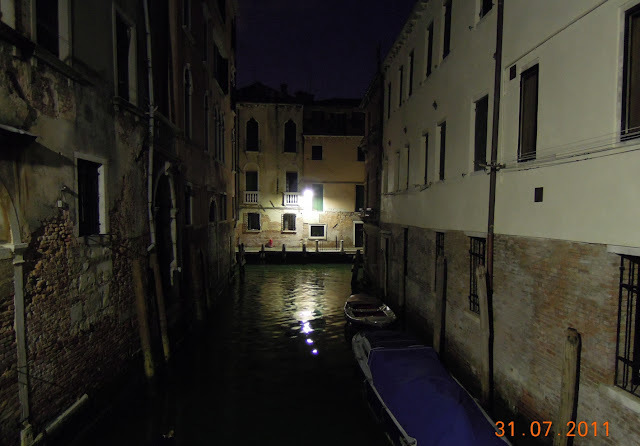 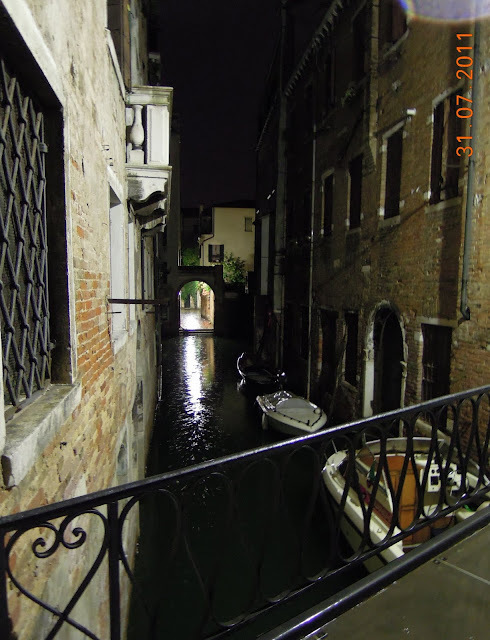 By the way, cycling in Venice is strictly forbidden by local municipal regulations…but in the heart of the night and in the rain … who cares!!! 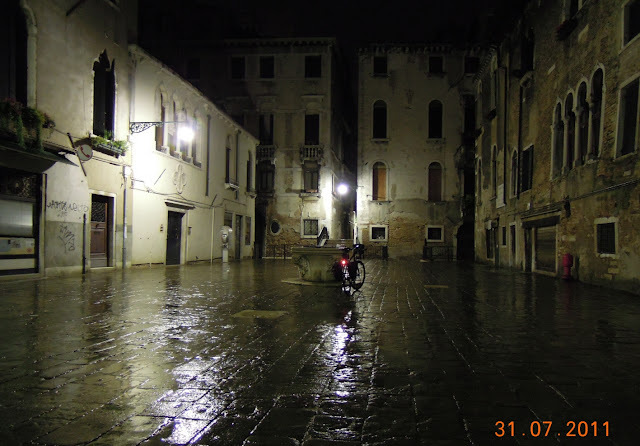 Who cares about a “strange guy” … who likes to cycle in the dark and … in the rain!! I then started to go along canals crossing an infinite quantity of bridges. 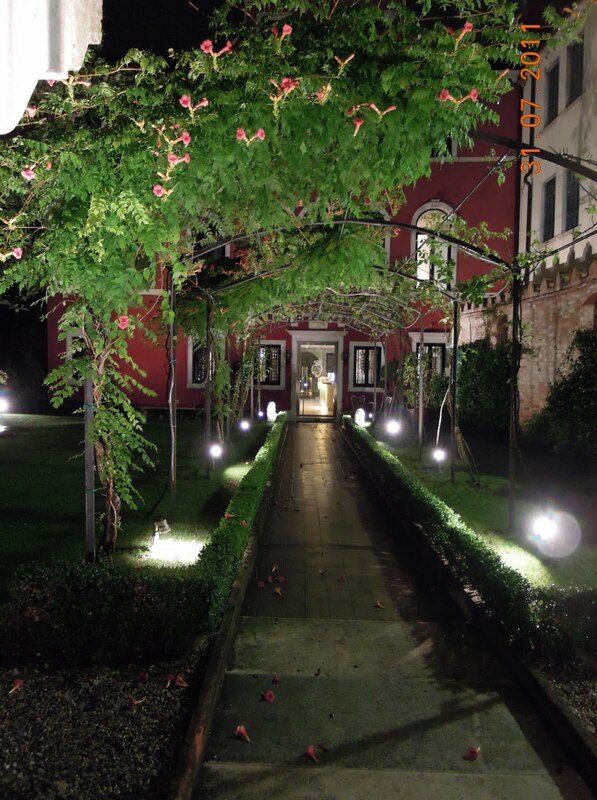 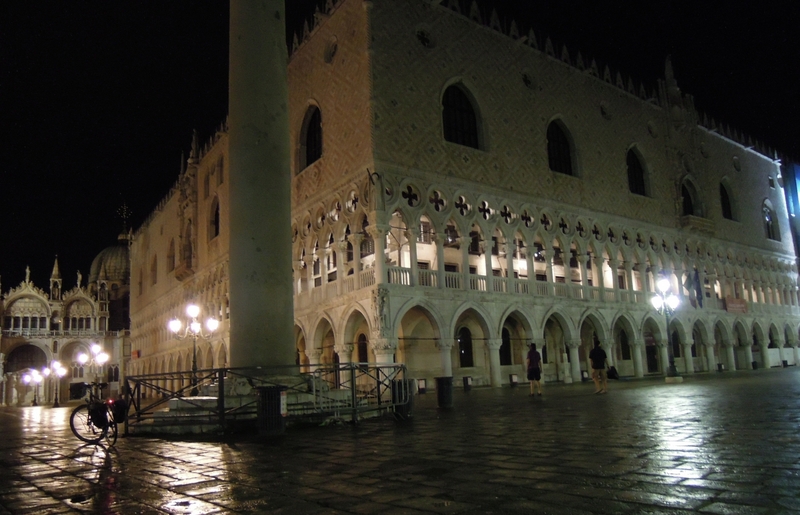 Rain, water everywhere, dim lights, wonderful buildings façades and historical squares, less famous calli e campielli, and all over around, simply a magic “silence” atmosphere. 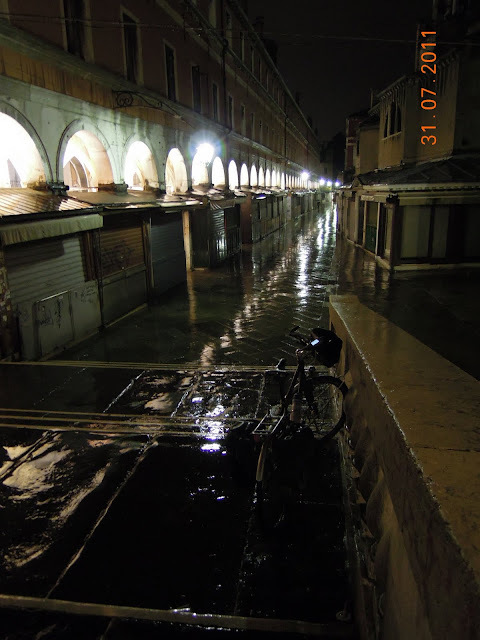 That’s Venice … as I’ve never seen it before. 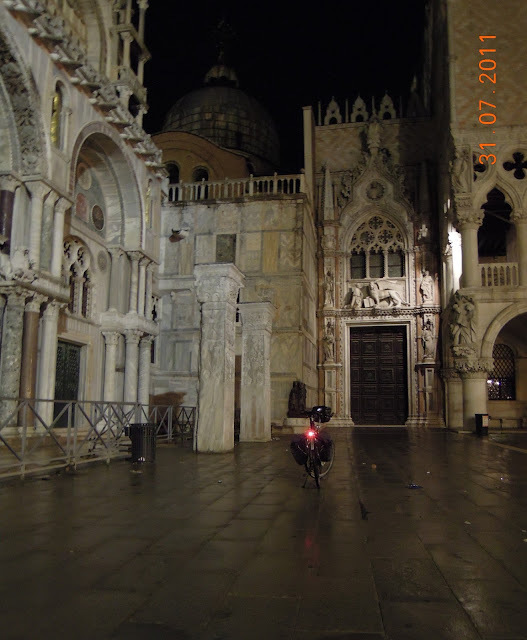 Fifty kilometres, till sunrise, breathing with no interruption an exclusive, infinite and unique beauty. 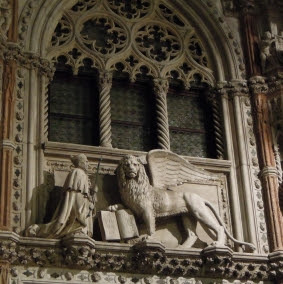 Olá Corrado. 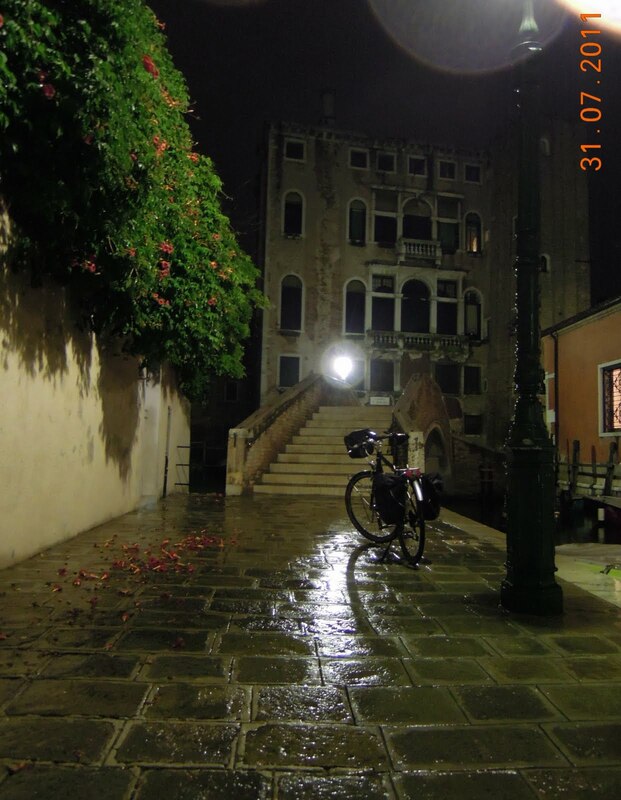 Devo dizer que esta é uma veneza desconhecida para muitos pois totalmente deserta. 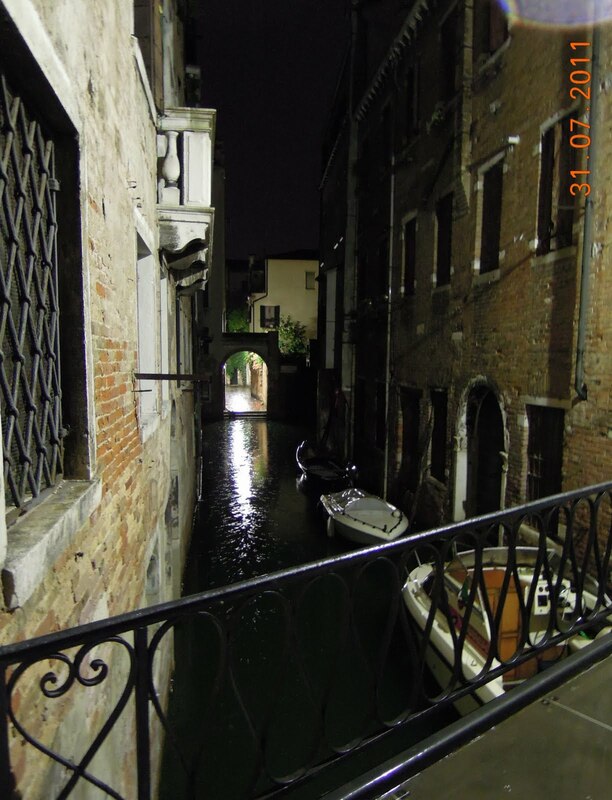 A Veneza que vemos é, em geral, lotada de turistas. Muito interessante seu passeio noturno. E ainda estava chovendo, o que deu um brilho maior às fotografias. Eu não sabia que dava para pedalar em Veneza. 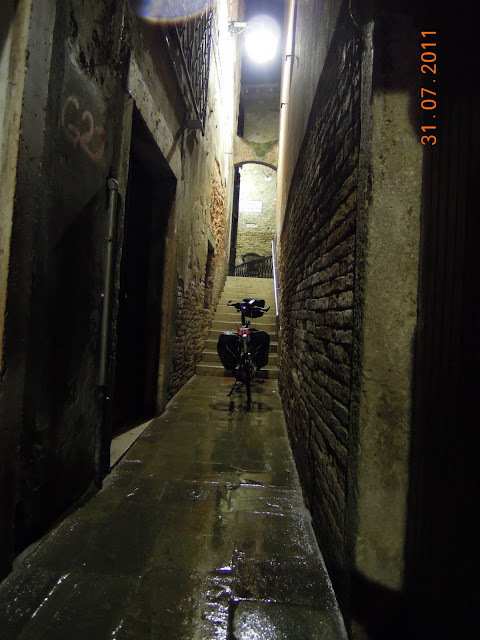 Penso que vc poderia escrever algo no post para a gente saber de onde vc saiu, como foi a pedalada, quanto tempo, etc. 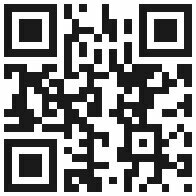 Abraços, parabéns.